(verb) Porpoising is the act of leaping in and out of the water in a rapid series of short, shallow arcs while swimming, creating an undulating or wave-like path. This type of swimming is less energy efficient than staying completely submerged, but it has the benefit of allowing the birds to breathe more regularly and therefore swim much longer distances at greater speeds. It is also believed that deliberate porpoising may be used to confuse and disorient both predators and prey, which may not be expecting swimming birds to leave and reenter the water. Some observations have shown that birds may also make these leaps simply out of joy or excitement. The length of a porpoising leap can vary from 2-6 feet (.6-1.8 meters) depending on the water conditions, bird size, and swimming speed. The exact height of the leap and the angle of leaving and entering the water also vary, but these are generally low leaps at shallow angles that maximize the distance covered without wasting effort or energy to reach greater heights. The number of individual leaps in a porpoising series will also vary, but in general the action is not considered porpoising unless there are several leaps in quick succession. Some birds will incorporate porpoising leaps as they leave the water, shooting up onto a bank and getting a considerable distance from the edge with a last leap as they reach land. For birds that are more awkward and ungainly out of the water, this can help them get a good start without struggling to get ashore, especially if the bank is steep or has a slight drop compared to the water level. This is also an effective way for a swimming bird to avoid an aquatic predator such as a seal, orca, or shark as the fleeing bird exits the water. Some birds can be very adept swimmers, but not all aquatic birds use porpoising techniques. There are several other types of swimming that are similar but should be distinguished from porpoising. Plunge Diving: Birds that plunge dive quickly enter and exit the water in pursuit of prey, but they do not make multiple leaps in succession. Instead, they enter the water from a significant flying height to surprise prey, but leaving the water is a less elegant maneuver and the dive cannot be repeated until the bird has regained sufficient height. Plunge dives, then, are single events, with fast entries and slow exits. Ospreys and other piscivorous raptors often use plunge diving as they hunt, and it is a common tactic with terns, kingfishers, and pelicans as well. Underwater Flying: Some birds, such as dippers, anhingas, and divers, are amazing underwater fliers that use their wings for both propulsion and steering below the surface. When they break the surface of the water, however, they do not jump in arcs above it, but rather either pause at the surface to breathe or leave the water completely for a perch or to take flight. This swimming is completely under the water and does not include any of the leaping that makes porpoising distinct. Dabbling: Many types of ducks, geese, and swans "tip up" with their rumps and tails in the air in order to forage below the surface of the water. While they are partially in and out of the water while dabbling, they are not moving in a quick jumping sequence, and so are not porpoising. Dabbling is most often done while stationary or moving only incidentally, rather than the rapid, lengthy movements of porpoising. Birds that regularly use porpoising have several physical adaptations that help them be more efficient, powerful swimmers. They are equipped with powerful flippers that help them porpoise more easily and for greater distances. Birds that porpoise have streamlined, tapered bodies that allow them to break the surface of the water easily on these types of leaps without risking injury. Their bills may even have a gentle curve to help pierce the water's surface more smoothly. These birds also have generally shorter but very powerful legs and webbed feet that help propel them out of the water, as well as to help their underwater swimming and maneuvering. 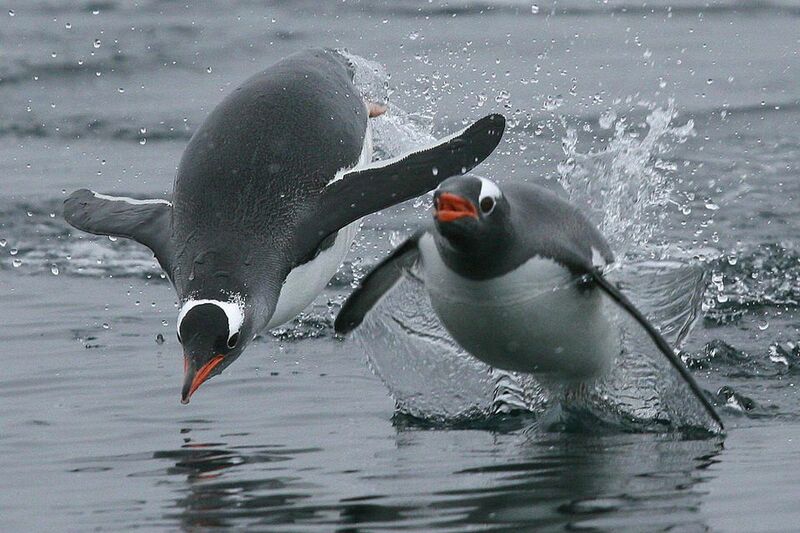 Penguins are well known for porpoising, and are the most accomplished birds to use this swimming technique. Other swimming seabirds such as murres and auks also practice porpoising while in the water, but to a lesser extent and with less agility and success. Do Penguins Have Wings? Yes - They're Called Flippers!